I have an Internet connection which plays YouTube videos with HQ option smoothly (zero buffering delay). It isn't fast enough, however, to directly play videos with the HD option turned on. It's a little odd that YouTube does not provide the lower, HQ option on those videos where it provides the HD button. For me, this means that I can only play them in the (poorer-quality) standard version (since my connection isn't fast-enough to play at HD). 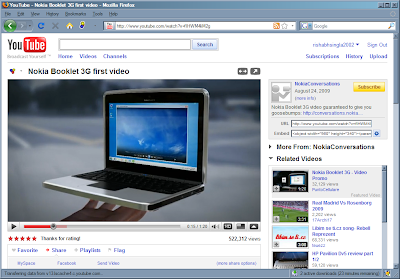 So I can't watch Nokia Booklet 3G first video at HQ (unless I use Video DownloadHelper, of course).